"When the mood took him, he surrounded himself with saucers brimming with pure colour ... Swiftly he would cover a sheet of paper with his great general tint. Into this before it was dry he would, in the most dexterous fashion, introduce some design out of his sketchbook. He would with the colour still wet, tilt the paper this way and that, letting the wash settle into forms which he would later utilise. 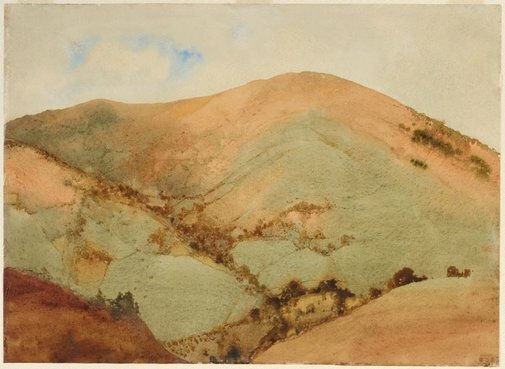 His long experiments had given him a dexterity in the use of all sorts of inventions in the practise of water-colour which has certainly never been equalled by any Australian water-colourist." Young was a leading practitioner in watercolour in Melbourne in the first decades of the twentieth century. His experimental approach using washing, scraping and rubbing back of the paper, highlights the staining and dilation inherent in the watercolour medium, especially when used in large formats. In Dry weather, he handles the massive forms of the landscape by the use of transparent layers to create an illusion of depth - recalling traditional Chinese watercolour in his use of non-linear space. Signed l.r., brown watercolour "BLAMIRE YOUNG". Not dated. Jean Campbell, Australian watercolour painters 1780-1980 , Adelaide, 1983, 91 (colour illus.). Australian watercolour painters: 1780 to the present day , 'The twentieth century to 1914', pg. 92-109, Sydney, 1989, 94 (colour illus.). Gavin Fry, Parallel visions: works from the Australian collection , 'J.J. Hilder / Blamire Young / Norman Lindsay', pg. 72-87, Sydney, 2002, 75, 77 (colour illus. ), 146, 147. The Australian landscape and its artists , Rushcutters Bay, 1977, 56 (colour illus.). Our country: Australian Federation landscape 1900-1914 , 'Introduction', pg. 16-22, Adelaide, 2001, 13 (colour illus. ), 158. Daniel Thomas, Art and Australia , 'Australian collection', pg. 52-62, Sydney, Jul 1972, 54 (illus.). Editor Unknown (Editor), The Christian Science monitor , 'The home forum', page unknown, Boston, 14 Jan 1956, page unknown (illus. ).